This journey began almost 2 years ago when Gavin suggested our walking the Camino de Santiago de Compostele to celebrate reaching 70. We watched the movie, “The Way” with Gavin, did more reading about the pilgrimage and came to the decision that we would like to give the Camino a try. Thank you, Gavin. All of you have encouraged and supported us with this endeavour—whether it was walking with us as we trained or just believing in us. Your gift from MEC to outfit us has us being the best decked out (not the best looking:>). We are grateful to have such a loving family to help us celebrate our aging and Mutti’s recovery. Thank you all. xo We hope our Blog will enable you to “walk” with us and share this special time. 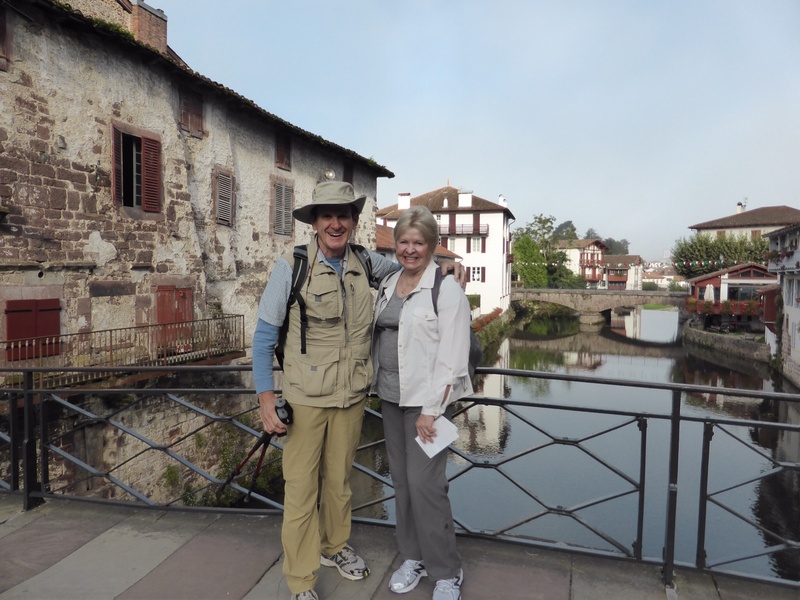 We are travelling the traditional pilgrimage route (Camino Frances or Camino Napoleon) which begins on the French side o f the Pyrenees at St. Jean Pied de Port. Our choice to walk on our own and not with a tour company is because we want this journey to be “ours”, at our own pace, have non walking days and our choice of overnight stays and accommodation. Ferry to mainland. Thank you to good neighbour, Connie for getting us there on time. Drive from ferry to airport with Ryan. Thank you, Ryan for navigating Vancouver traffic and getting us to the airport in good time. Depart Icelandair with a short stopover in Reykavik. A glorious sunrise welcomed us as we landed—Iceland looked like a green jewel in a topaz sea. Sorry, we did not get a picture. Arrived in Paris with a couple of hours to get our train to Bayonne. Arrived Bayonne (after a train change) —we have been travelling for 30 hours now. Our hotel “Cote du Basque” is right by the train station. It is centuries old (like we feel at this point) but it is clean and cosy. Despite being right across from the church bell tower, we sleep soundly. The morning we spent walking around Bayonne. This town is ”famous” for the invention of the bayonette and mayonnaise —which used to be called “bayonnaise”. In the early afternoon we boarded the train for St. Jean Pied de Port. This was our first encounter with other “pilgrims”. Everyone was decked out in hiking gear of various sorts (not a good look) and looking for the toilet which happened to be out of service:>) Mid way we changed to a bus as there is not a train to St. Jean. There is a slight drizzle when we arrive but we are able to schlepp our bags to our hotel. Luggage wheels on wet cobblestones are a challenge. 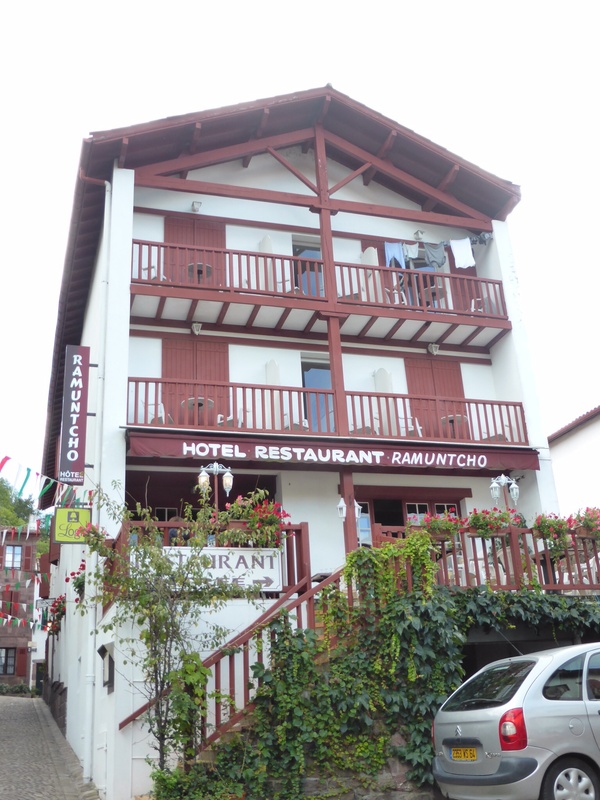 Our hotel is very nice—considered a heritage building in a town where buildings date from the Middle Ages—so it is old. We are so happy to be here that we are loving everything. Our day to check our preparations…hopefully we have not forgotten anything important. It is also a day to tour St. Jean and get our “Credencial”. The “Credencial” involves going to their office where kindly volunteers help you register and present you with your scallop shell and stamp card. The scallop shell is to hang on your pack and identifies you as a pilgrim which then encourages the locals to help you along the way. The stamp card is proof that you have walked the Camino—-each stop you receive a stamp either from a church, the auberge, or pensions. You must walk a minimum of 100K or bike 200K to qualify for your Compostele certificate. St. Jean is a charming village enclosed by a massive stone wall. The houses arise from the river which is crossed with several pretty stone bridges. 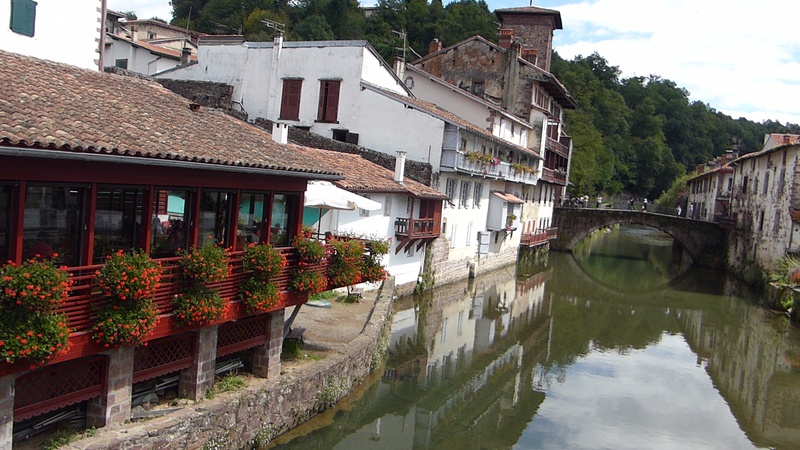 It is the traditional beginning for the Camino Frances and this weekend it is busy with pilgrims arriving and tourists enjoying hiking, kayaking and the spas. It is a bit off the beaten track and thus a popular retreat. St. Jean is in the Basque area of France. Much of the Camino traverses the Spanish Basque countryside. Very impressed with your blogging! Love that picture!! Looking good! I’m just so proud of the both of you!!! May God be with you on this special journey.